Grave Grabbers Video Slot Machine - Casino Answers! Grave Grabbers is a 5-reel, 20-line video slot developed by Top Game, featuring a wild symbol, multipliers, a free spins feature and a bonus game. You can play the Grave Grabbers video slot at Bovada. The Grave Grabbers casino game is a penny slot. Bets on the Grave Grabbers slot machine are $0.01, $0.05, $0.10, $0.25, $0.50, $1, $3 and $5. You can select from 1 up to 20 paylines on a spin. Grave Grabbers’ minimum total bet is a penny per spin up to the maximum total bet of $100 per spin. This is a good betting range that should suit most online slots players. 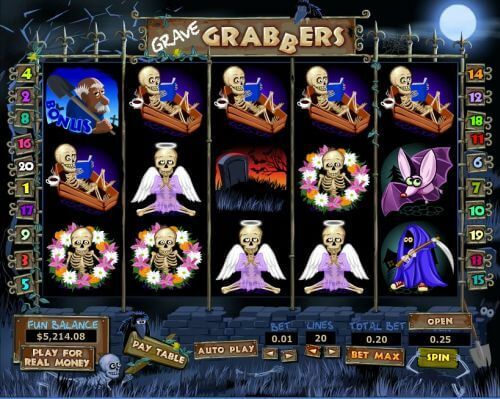 To play the Grave Grabbers slot game, select your bet and press the “Spin” button. You can also play all 20 paylines by hitting the “Bet Max” button. The top-paying symbol on the Grave Grabbers slot machine is the Haunted House symbol. When you land 5 Haunted House symbols on a selected payline, you will win the 5000 coin top jackpot. The Haunted House symbol is wild and will substitute for all symbols except the two bonus symbols. The second highest paying symbol is the Ghoul symbol (1000 coins). The free spins symbol on the Grave Grabbers video slot is the Gravestone symbol. Hit 3 or more Gravestone symbols anywhere on the reels and you will win 12 free spins at up to a 10X multiplier. You will receive a 3X multiplier for 3 Gravestone symbols, 5X multiplier for 4 Gravestones or a 10X multiplier for 5 Gravestones. You can win huge by triggering this feature using all 5 Gravestone bonus symbols when you play Grave Grabbers at Bovada! Payouts are displayed on the Paytable. All symbols pay left to right, except for scatters (which pay on any position). Free spins feature and bonus wins are added to payline wins. All wins are multiplied by the bet per line. The Grave Grabbers slot machine has a basic autoplay mode. Press the “Auto Play” button to access the autoplay controls. You can use the “+” and “-” buttons to select anywhere from 5 to 95 autoplay spins (in increments of 5). Press the “Start” button to begin the autoplay mode. To stop the Grave Grabbers autoplay mode at any time, press the “Stop” button. Top Game has come through once again with a solid video slot in Grave Grabbers. 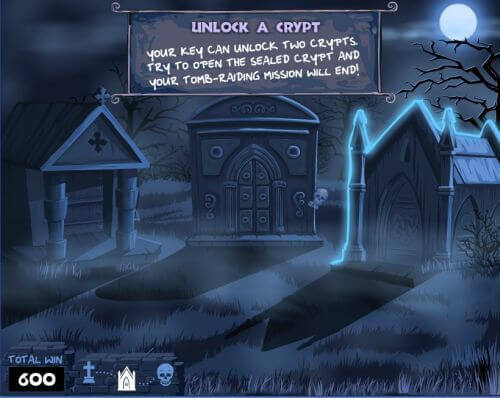 Grave Grabbers is perfect for Halloween or any late night where you just want a spooky slot game to play. Grave Grabbers offers a good top payout, a free spins feature (with a potentially gigantic multiplier) and a bonus game! You can play the Grave Grabbers Halloween video slot when you sign up and make a deposit today at Bovada! Can players from the United States play the Grave Grabbers online slot machine for real money? Yes, American players can play the Grave Grabbers slot game for real money at Top Game casinos like Bovada. Where can I find more Halloween video slots to play? You can read more Halloween slot reviews right here at Casino Answers! Is there a Grave Grabbers Flash game available? No, there is no Flash game available for the Grave Grabbers video slot. To play it, you must download the casino software at Bovada.